While in Italy I make it a priority to taste as many flavors of gelato as possible (that sentence is almost laughable). Days before we left Florence---over two year ago (wrapping up our trip abroad)---Anthony, Caleb (my two sons) and I went to Florence’s Gelato Festival. We walked from one piazza to another, trying a myriad of flavors from cantaloupe to rice, tiramisu, watermelon and biscotti. I was recently in Florence again, this summer (spoiled me!) and tried peach, salted caramel, goat cheese and espresso. 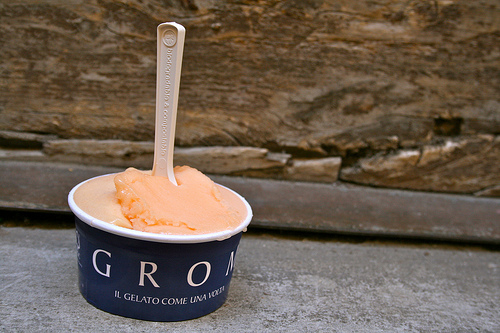 Festival aside, while living in Florence we tasted gelato at many little shops in the city center; we established our favorite haunts---Grom, Gelaterio del Neri---places we could count on for a worthy cup of gelato. Happily during this summer's quick trip to Florence, I found two more gelato places that are 'haunt-worthy'. And truth be told: not all gelato is created equal. 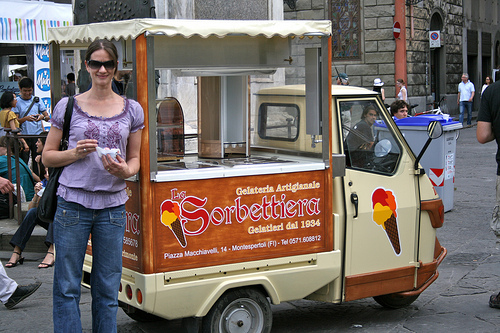 I am a bigger fan of artisan gelato with unusual flavors made from high quality ingredients. If you want really, really good gelato in Florence I recommend cantina del gelato and Perche No. Hands down. Or shall I say ‘spoons in'?! At Cantina del Gelato I tried 'cafe plus caramello', sesame and 'goat cheese with walnuts'. They have unique flavors and disciplined though you may be: you will want to buy seconds. Easy to find: it is just east of the Ponte Vecchio on the Oltrarno side of the Arno. 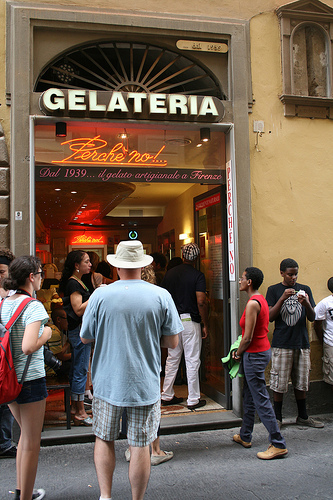 The other hit was Perche No; I was introduced to this gelataria via a Taste Florence tour, where we succumbed to trying eight yes EIGHT flavors of gelato… with a few sorbets thrown in. Loved the watermelon and their pistachio, and there was a creamy orange one with marmalata… Perche No means 'why not?' in Italian... I rest my case. Plus: it is located within blocks of the Duomo. Not in Italy? Want to taste some authentic gelato? You can buy Ciao Bella Gelato in a number of grocers in the states; it is worthy gelato---even if you aren’t staring right at the Duomo. Ciao Bella did send me samples and a Gelato-making cookbook; because I couldn't help it, I cracked the book open and made cinnamon gelato. Cinnamon Gelato is one of my favorite flavors! (and why not plunk it on top of your pumpkin pie?). Ciao Bella has done a brilliant job bringing a cacophony of flavors to the market, and trust me: you WILL find a new favorite. (Incidentally, if you know me, you know I am ALWAYS on the search for 'new favorites' of any and all kinds). Here is a teaser: Malted Milk Ball, Chocolate Jalapeno, Key Lime Graham, Bourbon Butter Pecan, Maple Ginger Snap, Cinnamon (ahem! ), Fig Balsamic and a classic Italian fave---Toasted Hazelnut. Case in point: you really don't need to be in Italy to have your very own gelato festival. So try some already!